Okay, quick poll: who has never heard of Terry Pratchett or the Discworld? I see a couple of hands, it’s hard to believe but there are still some people left. Sir Terry Pratchett is one of the most successful fantasy authors of our time and the Discworld series of books is his great contribution to literature. The Discworld is a world not unlike others. Actually, it is quite unlike ours, the Discworld is indeed a disc, resting on the backs of the four great elephants who, in turn, are standing on the back of the turtle Great A’Tuin, on its way through space to an unknown destination. The biggest city on the Discworld is Ankh-Morpork. It has more than a million inhabitants from all the species of the Discworld living there and all the problems you know from a city of that size here. Including a river that is so dirty you can draw the chalk outlines of the corpses you find there. Ankh-Morpork is a highly specialised democracy based on the principle “one man, one vote”. That one man is the Patrician. He has the one vote. In any other city, he would be called a tyrant and quickly disposed of. In Ankh-Morportk, he is still called a tyrant – not usually to his face, at least never twice by the same person – but has so far not been disposed of because he is, from almost all points of view, the lesser evil. Better to have a disinterested tyrant that keeps the city running than to have someone on the job that’s only in it for his own profit. 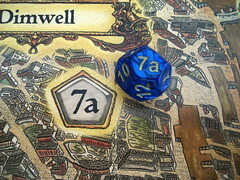 And that’s where we enter Ankh-Morpork the game. The unbelievable has happened, the Patrician has disappeared, and the resulting power vacuum demands to be filled immediately. The players are the ones to fill it, each in their own way according to the secret role card they draw. The Lords Selachii, Rust and de Worde want control of the city for themselves by having more game pieces in a number of neighbourhoods than any other player. Dragon King of Arms, head of the guild of heraldists, aims higher than that. His goal is to reinstall a king in Ankh-Morpork, and to do that he wants to cause enough unrest in the streets – marked by a trouble marker in the neighbourhood – that people demand a strong king to fix the situation. Chrysoprase, the troll godfather of Ankh-Morpork would consider it a victory if he can just make enough profit from the situation and Commander Sam Vimes of the Ankh-Morpork City Watch is just trying to keep things from falling apart until the crisis passes: he wins when the cards run out and no one else has won yet. Or Lord Vetinati, the Patrician, may reappear from wherever he was, if he can just get enough of his minions in position first. 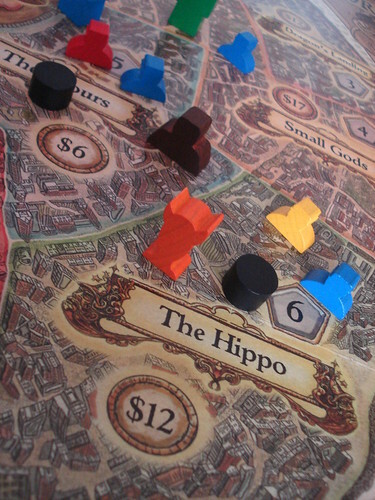 The game is played on a map of Ankh-Morpork – what else? – showing twelve of the more prominent neighbourhoods, with their minions ready to strike in three of them: Dolly Sisters, The Scours and The Shades. If I was a minion I wouldn’t want to start my career in The Shades – they eat assassins for breakfast in there, after picking their pockets and selling their ears for necklaces. It’s a bad place, trust me. 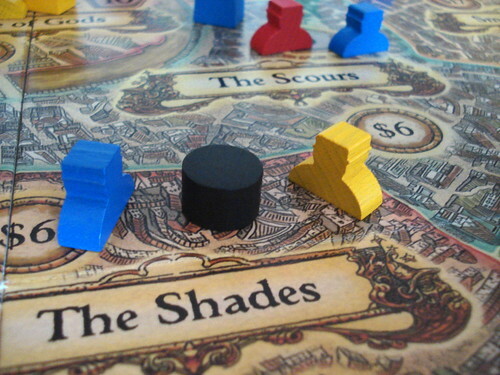 You struggle for control over Ankh-Morpork by playing a card from your hand each turn, and those cards are where the game really, really shines. Not only are they at the core of the game mechanic, they are also gorgeous. Each card is not simply an action card, it represents a character, group or establishment from the Discworld books, complete with illustration, and the artist team Bernard Pearson, Peter Dennis, Ian Mitchell and Paul Kidby have done an amazing job: all the pictures are spot-on. On top of that, the actions they let you do match the character as well. Some actions are repeated across many cards and indicated by an icon, but many cards also have unique actions given in text. All actions except the Random Event action are optional, but on cards with more than one icon they have to be executed in that order – which is quite often inconvenient. The two more complex actions – they are not very complex, mind, but moreso than the others – are placing minions and buildings. When you place a minion, you place it in an area that already has one of your minions or an adjacent area. As I said, not very complex. The kicker is that, when you place a minion in an area already containing one, you also place a trouble marker there. Trouble markers identify an area of civil unrest, or rather, of more civil unrest than usual in Ankh-Morpork. They also stop you from placing building in the affected area and make Dragon King of Arms win the game. So, unless you’re Dragon King of Arms, you will most likely want to get rid of them. That’s also easy to achieve, you simply remove one minion from an area and the trouble marker disappears. Even if there is more than one minion left in the area, it’s important to remember that part. Once you have a minion in an area and ended the local troubles, you can consider placing a building. If you can pay the price and there is no other building there alread, you place one of yours and take the card for that area. Those cards allow you a special action each: some let you simply take money or place minions, others let you sell cards, exchange them or protect your minions from random events. The further actions are indeed less complex. With an assassination you do exactly what you’d expect: remove a minion from anywhere on the board. The only requirement is that the area where you strike needs to have a trouble marker. Assassination is present on cards of members of the Assassin’s Guild, and thematically fitting all of those also bring you some money. No assassin would work for free, after all. Receiving money is another simple action present on many cards. On the other side of the law, you have the Ankh-Morpork City Watch. Watch officers can generally remove trouble markers. Finally, many cards allow you to play another card right away. Two other icons can show up on the cards. One causes a random event to be drawn and executed and is the only action that is mandatory to execute. Random Events are never good, something always gets destroyed, either by the river Ankh, or by a dragon, or by Trolls or a number of other natural desasters. And some select few cards have the hand icon, telling you they can be played outside your turn to prevent an opponent’s action. Each of the 101 action cards is unique, no character shows up twice, and they all have their own art. Many Discworld fans will consider that their money’s worth already. But what about the game itself? You can see it from the rules, the game is not hugely complex, all the possible actions are explained in a couple of minutes, including the intricacies of trouble markers. A few minutes more and you have explained the different player characters. Don’t forget that part when teaching the game. Finding out what are your opponents’ roles is an important step to victory. Being able to bluff that you’re playing another role than you really are is another good reason to know those roles. Despite the ease of the rules, the game is not trivial. Chosing your actions and where to execute them is a light but not brainless type of gameplay. You are, however, very much at the mercy of The Lady, the one Discworld goddess that only helps when you do not pray to her, that abandons you soon as you mention her name, she with the green eyes, patron of hopelessly outmatched gamblers. If she is not on your side, then your chances to win are slim. We had games where one player didn’t get a single chance to build a house, for example. Or games where one player lost 4 houses to random events. Most games have an element of luck, but Ankk-Morpork may have a bigger one than it really needed. It’s also a game that doesn’t want you to be friends. Most cards don’t allow for much direct interaction, but the ones that do don’t tell you to have tea together. Assassination, stealing money or cards and screwing others over by placing or removing trouble markers at a bad time (for them) are all part of it. There may also be a leader-bashing problem in your first couple of games, but that’s why you learn to bluff about your role: no one will bash you when they don’t know that you’re the leader. Ankh-Morpork is a great game for Discworld fans for the art and theme alone. You may be a bit disappointed that the game doesn’t tell a Discworld story, but no game could ever manage that. For everyone else, the game still looks great and offers good if light entertainment. And it might just be the first step to becoming a Discworld fan. Dixit is a very creative communication game that has you describe and guess at picture cards. It’s much more fun than this description sounds, fun enough for this year’s Spiel des Jahres award. Tombouctou from 1993 thematically sounds like a caravan trading game, but it turns out to be a deduction game where you protect your cargo from thieves by figuring out where they strike first. Micro games, very small games with few components and few rules, quick to explain and to play, are a minor trend at the moment. They don’t usually keep you entertained for the whole evening, but they are nice to play a round or three while you wait for pretty much anything. Even in a waiting room or on a train, because they’re very portable. Empire Engine is a micro game by Alderac where everything is about cogs and wheels. The whole planet the game is set on is made from cogs and wheels. Although we do like our deep, strategic games, not all games have to be that to be fun. In fact, when done well, even very simple games involving trivia knowledge can be a ton of fun. An abstract strategy game by Gigamic from 1991. The rules are explained in about 2 minutes, but that doesn’t mean the game is easy to play. Expect to put some brain juice in order to win. Welcome to the Wild West! You might not want to get to comfortable on your horse and take some cover behind that barrel there, the west is particularly wild today. Not only is everyone shooting everyone else, no one is even sure who is on their side. But in a real Western, that matters less than putting lead in the air, so get shooting.